Welcome to September! It’s Kay Francis month on Turner Classic Movies, something which regular readers will know I’ve been pee-my-pants excited about for quite some time. The festivities kick off this evening at 8:00 PM Eastern with “Raffles” (1930), a hard to find film which has never before shown on TCM. There are going to be so many great films: “Jewel Robbery”, “Trouble in Paradise”, “In Name Only”… basically, don’t make any plans for September, is what I’m saying. 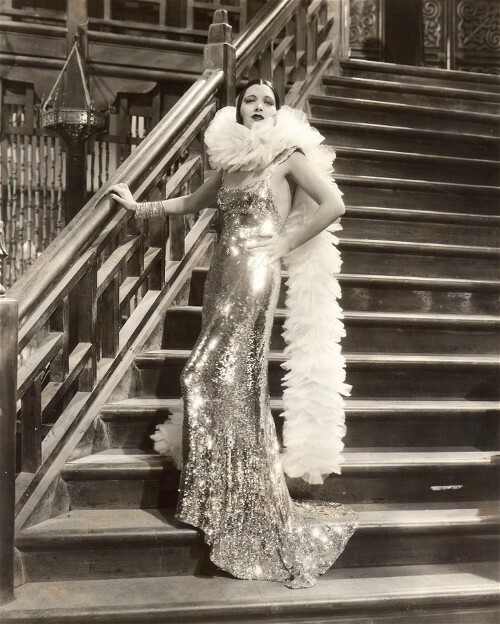 I chose “Mandalay” (1934) to celebrate Kay Francis month. It’s one of my favorite Kay Francis films, an over-the-top melodrama that you can really sink your teeth into. As usual, there are spoilers. “Mandalay” will be shown on TCM on September 25 at 8:00 PM Eastern. Tony Evans (Ricardo Cortez) is a gunrunner currently docked in Rangoon, Burma. In 1934 Burma was a British colony. Rangoon is a port city and served as the cultural and commercial hub of Burma while under British rule; it replaced Mandalay which had been the last independent capital of Burma until the British captured the country in the late 1800s. The British ruled Burma as part of India until 1937, when it was ruled as a separate country. During World War II Japan and Britain fought over Burma, but Burmese independence was finally achieved in 1948. Tony works for himself but the local kingpin Nick — played by Warner Oland in yellowface — doesn’t trust him. He wants Tony in his own gunrunning business, mainly to keep an eye on him. He invites Tony to his club, the J’Ardin Orient, for dinner that night to talk about his business offer. The J’Ardin Orient is a combination hot spot and sleazy saloon catering to all kinds of illicit trade. Tony and his beautiful Russian lover Tanya Borodoff (Kay Francis) sail into Rangoon on their houseboat to Nick’s. Tanya is both charmed and surprised by atmosphere, the men in tuxes, half-naked dancing girls behind sheets of peek-a-boo gauze, the copious liquor. Half amused and half jealous, she asks Tony if he goes there often. Tony and Tanya are invited upstairs to Nick’s office, where Tanya charms the underworld types with her beauty and singing. Nick takes Tony into the back room where he explains that the authorities are on to him, that Tony has to leave immediately if he wants to stay out of jail and get his current cargo sold. Nick makes it clear that he wants Tanya as the “hostess” in his club — “hostess” meaning the head prostitute in his brothel — to replace Madame Lecalle (Rafaela Ottiano) who he feels is now too old for the job. Being a fine, honest, upstanding sort, Tony without much more than a brief second of consideration flees out the back way and leaves Tanya to a horrible fate. She’s captured and essentially held against her will, although the movie glosses over this so much that you have to wonder why she doesn’t just walk off. Tanya sobs in her new bed at Nick’s, crying in fear and at Tony’s betrayal. Madame Lecalle comforts her by telling her that men have used her to get their way, now it is her turn to use men to get what she wants. Tanya steels her self in determination: she will get her power by using men the way they have used her. Time has passed. Nick’s place is hopping with plenty of rich white male customers looking over the young Asian girls being offered for a price. All eyes turn to the staircase where Tanya, scowling and slithering her way down the stairs in an immense boa and amazing skintight dress, makes her entrance. She’s glamorous sequins and feathers on the outside, pure cold contempt inside. Every man is drawn to her; she now calls herself “Spot White”. “Spot Cash is more like it,” quips a patron. Tanya is apparently making a killing. While the movie doesn’t go into it directly, it is implied that Tanya is seen as the classy prostitute of the bunch because she is a white woman. The interesting thing about it is that a white-skinned person being “better” is not portrayed as a positive thing, which is the opposite of what you’d expect for a film of this era. The entire business is seedy, women are used against their wishes, their bodies as commodity. “Spot White” is her cynical and ironic name for herself, highlighting her “asset” of whiteness while also referencing her value as a product, as well as her own personal debasement. There’s a quick montage of wild parties with a circular inset in the film showing Spot White with her men, who lavish her with jewels and money. This technique is dated but actually quite effective — you should read goatdog’s blog entry about it. There is some lovely cinematography in the film, including a long shot done on the water while following Tony out to his boat and the awaiting Tanya. The scenery in Rangoon is lovely as well. Spot White has a habit of pulling pranks and causing trouble. She doesn’t do subtlety, and the police are frustrated with her behavior. The police chief calls her in and threatens to deport her back to Russia. Spot White in turn shows off her garter to the chief — it’s covered in his medals, gifts given to her during moments of, er, passion. Somehow he didn’t realize that the woman he had been frequenting at Nick’s was Spot White, and he finds himself being blackmailed by her. She offers him the medals back for $10,000. He agrees. Spot White takes the money and sneaks off to a boat setting sail on the Ayeyarwady River, heading north to Mandalay and escape. She gives her name as Marjorie Lang and buys a ticket without anyone suspecting who she really is. 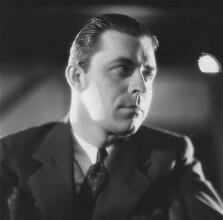 As she unpacks in her cabin she accidentally cuts herself, and despite her protests the steward fetches Dr. Gregory Burton (one of my pre-code faves, Lyle Talbot). Burton is a medical doctor and fellow passenger on the boat. Gregory and Marjorie are attracted to one another, mostly because they both sense there are deep secrets in each others’ pasts. Gregory tells Marjorie that he is going to an area near Mandalay where a deadly strain of flu is rampant. It’s a suicide mission but he feels compelled to go on this humanitarian cause. One night early in the cruise, Marjorie finds herself nearly alone in the bar. She sits at the piano and sings just as she had the night Tony sold her in exchange for his own freedom. After singing she discovers Gregory falling-over drunk nearby. Unfortunately, a child in the lower decks is ill and the doctor is needed, but he is in no state to help. Marjorie goes to the child and finds him already dead. Gregory is thrown by this and confesses to Marjorie that he’s no good. While at West Point he performed surgery and botched it completely, killing the patient and driving him to drink. Gregory is headed to flu country near Mandalay as an attempt at redemption. Amidst all this burgeoning normalcy, Tony suddenly arrives on the boat. He boards at one of the ship’s stops along the river and gets the cabin next to Marjorie. While at dinner that night he spots Marjorie — who was Tanya when he knew her — and follows her back to her room. Marjorie makes hasty excuses to Gregory and retreats to her cabin. Her cabin joins Tony’s so she’s able to go into his room unseen. Tony hasn’t changed a bit. He’s on the lam and sees Marjorie as his prey. He asks her to forgive him, to just forget that he left her as a captive woman forced into prostitution, so they can get back together and go into some unspecified business. Marjorie is terrified. When Tony leaves the room, she goes to his medicine cabinet and brings out a bottle of poison. Later, she manages to go to dinner with Gregory but she is late arriving and quite distracted. Upset, Gregory goes drinking with the men again, including Mr. Peters. Marjorie talks with Mrs. Peters who is scandalously smoking outside and scowling at her drunken husband in the bar. Here I have just a little nitpick. Early in the film we’re told the couple is from Topeka, which they claim they own “the hardware store” in. Even in 1934, Topeka had a heck of a lot more than one hardware store. Later, when the wife is sympathizing with Marjorie about Gregory’s drinking, she says they’re from Emporia. I know this wasn’t a high-budget affair, but can we get the details right? I wonder how many people in Kansas in 1934 laughed at the mistakes. But the point is that the couple is provincial, yet Mrs. Peters gives good advice: men who drink don’t stop drinking, and at some point you either live with it or move on. That night Tony realizes the authorities have found him, and the captain of the boat has been notified to hold Tony until they get to the next port. Yet when the captain goes to Tony’s room, he discovers the poison on the table and the window of the cabin open. Since Tony is nowhere to be found, the captain suspects Marjorie of poisoning Tony and pushing him out the window into the river below. Marjorie is held in her cabin while the captain goes to wire the authorities in the next port. Gregory and Mr. Peters convince the captain that Tony must have committed suicide, so the captain decides to let Marjorie go. When Gregory tells her the news, she confesses her past to him. In her confession it sounds as though she did kill Tony, but she is somewhat interrupted by the arrival of authorities. They’re convinced by the suicide story, and Gregory doesn’t judge her at all. At that moment she gratefully realizes she loves him. Things seem to be better for Marjorie, so of course, Tony has to show back up again. He’s been in hiding on the ship the whole time. Marjorie apparently believed he had killed himself, and was being vague with the authorities to cover her past, not to cover a murder. Tony tells Marjorie that when they get to their next port — Mandalay — he wants Marjorie to accompany him. Tony has decided to go into business with her… as her pimp. Marjorie panics. It only takes her a moment to decide to really poison Tony; as he thrashes about in agony, he falls out the window into the river below. Nobody ever knows. The next day the ship docks in Mandalay. Gregory heads for his suicide mission in the flu country with Marjorie by his side, both of them looking for redemption. As implausible as the film is, I love this movie. Everyone exhibits the cool detachment of a typical 1930s drama while still managing to eat plenty of delicious scenery. The plot moves crisply along and never lingers, one of Curtiz’ main strengths. One of the best directors America has ever seen, Curtiz was an expert at advancing the plot quickly without losing the audience, and it works wonderfully here. 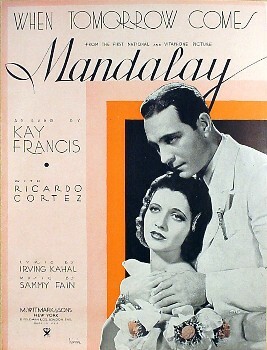 Fans of pre-code cinema and Kay Francis absolutely must see “Mandalay”. “Mandalay” promo #1 (sequins of doom!) courtesy of amy_jeanne at It’ll Take the Snap Out of Your Garters! Hello Eric! Long time no see. I agree Francis and Cortez have some chemistry. I haven’t yet seen “House on 56th Street” so I’ll keep an eye out for it. Hi Farzan! Thanks for the kind words. I really enjoyed your blog and added it to my blogroll, I hope you don’t mind. When I first saw this film, I saw the “Terry and the Pirates” perilous Far East comic strip aspect – they were almost contemporaneous, as “Terry” started only half a year or so after “Mandalay”‘s release, and this film may have provided inspiration for some of the atmosphere in that strip. 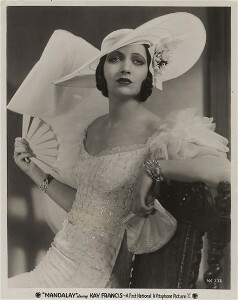 As one of the first Kay Francis films I ever saw, I wasn’t aware of her speech impediment before, and I figured she kept a job in talkies only thru extraordinary effort, and I was right as it turned out, altho her personal life was a kind of whoring out for fun and profit, (neither very long-lasting) that partially helped – the implicit blackmail worked both ways. I love the Maughamish touch with the fallen doc on “Mandalay”, this little of version “The Painted Veil” was one the slyest on screen, as I found their motivations more interesting than the original domestic split. The exotic East was never better done on a few soundstages, and boy did she look great – Kay had something naturally exotic about herself as well. There must be something to the Russian expatriate women in a decaying Empire setting, as I’ve run across it a fair amount in fiction, and as a matter of fact, there were quite a few enclaves off White Russians out on the Rim. Kay wasn’t conventionally pretty, AFAIC, and built like the flapper she started as, but her smile and a pair of the most expressive eyes ever on screen made her a great close-up study. She had a face that stuck in your mind in subtle ways – once a year or so ago, I did an open google picture search on an unrelated subject – danger, Will Robinson – and damned if a face very much like Kay’s didn’t pop up as the second likeliest result. Way wrong kind of website tho – couldn’t afford to click on that one to see anymore than the thumbnail, as it promised to bring it’s own kind of danger, but it reminded me how fascinated I was by Kay’s signature aspect: her eyes and eyebrows – no other dame in H’wood had ’em like Kay’s, and for that matter I don’t remember meeting anyone in real life with a pair quite like those. Right to end, too, I understand, and must’ve made it hard and easy for her as she aged in obscurity. I was amazed at her physical acting abilities, tho – few women ever moved so interestingly on screen, and I couldn’t understand how she was essentially buried and forgotten – it was a crime. I’m sure there’s never been such a wonderful tribute to Kay Francis before, and even her later, flawed results at Poverty Row are on on display, and damned if she doesn’t carry those off as well. And don’t get me started about her voice – impediment or not, she fairly dripped allure in that honeyed contralto of hers. I would’ve been a diary entry of hers, real easy. Some people go ga-ga over Cocoa Puffs, but the smart ones go ga-ga over Kay. She is “alluring” (couldn’t resist) in her films, photos of her, and her life story. The DVR will be humming all month. Great write up on Mandalay, and I think Vanwall summed up the essence of her appeal to a T. Long live TCM. I had to get my hands on this film after reading this review. Needless to say, I loved it. I’m a huge fan of Kay’s, and though a lot of reviews express disappointment that Mandalay turns into a melodrama, I don’t understand why viewers would and could expect anything else–Kay’s character isn’t introduced as some hard-boiled, cynical dame, she’s a soft, affectionate woman in love, who is eventually betrayed by her lover. One thing that I must mention: the number of films where the heroine gets away with murdering her villainous ex-lover! It seems to be a Pre-Code staple, as I’ve seen it repeated in such films as Letty Lynton and Midnight Mary (in which poor Ricardo Cortez gets his just desserts again!). Evangeline, I agree that I don’t know how anyone could go into “Mandalay” thinking it was anything BUT melodrama.